Area: 321 sq km. 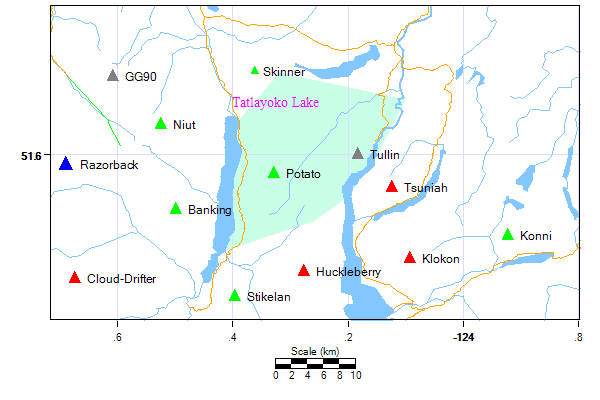 Location: This small range, actually two flat-topped north-south ridges, lies north of Cheshi Pass in between the northern ends of Tatlayoko and Chilko Lakes. The official name is Potato Range, but locals call these the Potato Mountains. History: The Potato Mountains were an important summer gathering place of the Chilcotin and neighbouring plateau peoples. As recounted by testimonials from Chilcotin natives in Sage Birchwater's "Chiwid", in the old days people would camp out on top of the mountain for a few weeks digging potatoes and holding horse races, rodeos and other games and social events. Even into the 1950s, entire convoys of covered wagons would make the pilgrimage to the foot of the mountain, leaving old people to worn out to make the journey to guard the wagons while the rest of the population went up on foot.